It’s been a few weeks since we really checked in on this season’s major storyline, Haley’s pregnancy and her rekindled romance with Dylan. A little while back there was an episode about the women struggling to put together a crib, but that bit of gendered ridiculousness is about it lately. It’s strange, because so much of the early part of the season was about Haley; her pregnancy, her love for Dylan, the reveal of her having twins, the struggles to cope with everything. Then, as if the lengthy sitcom episode order was just too much, Modern Family largely dropped her. “Can’t Elope” gets back to the season’s best material, and while it’s not the best episode by any means, it’s nice to see this plot moving forward once again. The narrative catalyst is Haley being admitted to the hospital with Braxton Hicks contractions, which lead to a revelation when the doctor assumes Dylan is her husband. Despite turning down numerous proposal, Haley has decided that it would be nice to be married when the twins come. She doesn’t care about how traditional it seems, it’s just a gut feeling, and that leads to her and Dylan trying to quickly get married at the courthouse without anyone knowing. The first mistake they make is asking Alex to be their witness, because she’s not good under pressure. She stumbles through a lie with Claire, and that leads to Haley feeling bad about eloping, and agreeing to have the wedding in the house instead, with Claire and Phil putting it all together. Some of the ensuing wedding chaos is rather predictable, from the “small, intimate” affair turning into something more elaborate, but the way the episode pulls a lot of threads together is somewhat inspired. 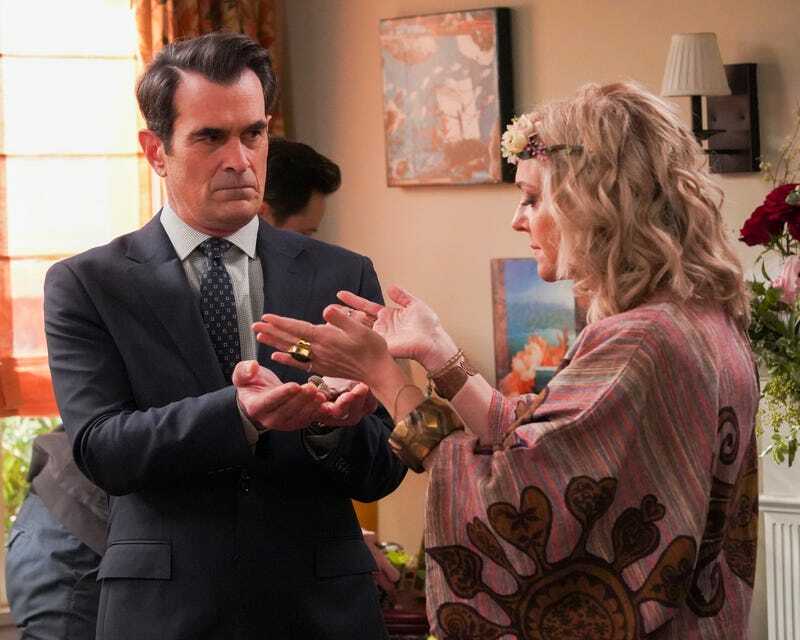 The glory days of Modern Family often found ways to kick of seemingly disparate threads and then tie them all together in the end, but in latter season’s it’s struggled to do that. Part of that is because the show has simply changed shape, growing to the point of telling separate stories rather than connected ones. Still, it’s nice to see the show work to make everything count. In other words, Jay trying to get his dog beds featured on a dog’s popular Instagram account is a storyline as irritating as they come, but in the context of trying to make it to Haley’s surprise wedding, it mostly works. I think what works is the fact that these subplots don’t have to carry all the weight. We’ve had a few episodes lately composed of simple, isolated A, B, and C plots, and that’s lead to a lot of forgettable material. But when those stories are wrapped up in something bigger, a weight is lifted. Now, Cam and Mitchell desperately torn between attendinf Haley’s wedding and going to a musical version of Sophie’s Choice that’s difficult to get tickets too isn’t just a meaningless subplot in an episode filled with them, but rather a complement to the larger story of Haley’s wedding. Look, both everything works here. “Can’t Elope” is undoubtedly overstuffed. It’s packed with characters, twists and turns, and Luke going on Tinder despite his older fling from last week’s episode, and it can be exhausting at times. There are good jokes here and there, but there’s just no room for them to breathe. The episode is heavy on plot turns, and that means it’s difficult to squeeze out not only genuine emotion—which should be a given in an episode about a wedding, even on a sitcom—but also jokes that land. But, “Can’t Elope” sticks the landing. I’ll readily admit that I often give Modern Family a break if it manages to pull everything together with a single emotional crescendo, but if I didn’t we’d be left with C+ grades for seasons on end. All the chaos leads to not only Phil and Claire giving Haley and Dylan their blessing to get married at the courthouse like they once did, but also Haley realizing she wants her parents there, and returning to the house and getting married in the middle of the night. What can I say? It’s sweet and moving and it gets this story to where it needs to be, and it’s a perfect cap to a chaotic episode. “It’s the cruellest decision anyone’s been forced to make.” Yes, I see what you did there. If you have to repeat “he’s a good father, he’s a good father” over and over again, perhaps your marriage isn’t as loving as you think.